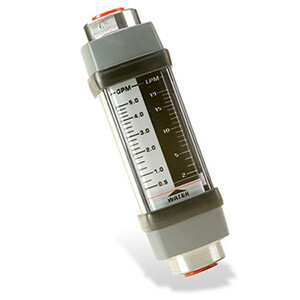 OMEGA™ FL-6400A in-line flowmeters are designed for use with many caustic or corrosive fluids. These meters feature stainless steel construction, and because of the unique construction design, they can be mounted in any position. The FL-6400A flowmeters have direct-reading scales for water on the metering tube, and, due to the sharp-edged orifice float, variances in viscosity have only a minimal effect. FL-6400A flowmeters feature a unique spring-bound design flow rate indicator, which can be used with both clear and opaque liquids for maximum versatility. NIST traceable certificate not available on units with direct read scales.